Mercury, messenger of the gods, travels around the sun creating cycle after cycle of predictable energy that we can learn to understand and even work with as we plan our projects and communications and deal with our everyday reality. While Mercury is direct, we are more inclined to project our thoughts and energies outwardly in order to accomplish all of the everyday things that keep our lives moving forward. Like all of the planets, Mercury has a clear and predictable cycle and can therefore provide us with important information about our everyday reality. Mercury appears to move backward periodically for approximately 3.5 weeks. In astrology Mercury is defined as the planet we associate with thinking, communicating and processing information through the brain and nervous system. It rules everyday communications and travel. It is associated with the signs of Gemini and Virgo. During the retrograde period of Mercury things tend to break down and all sorts of communication problems arise. The message is to go with the flow, keep impatience in check and see what the cycle is trying to teach you. Rather than pushing forward, it is a time of reflection, introspection and possible reworking that which is not quite ready to be put out there. We live in a world of immediate gratification so when retrograde, the frustrations tend to build up as we try to make things happen. Mercury retrograde teaches us to be more cautious, take a closer look at our projects and ideas and be patient while we take the time to reflect and reevaluate our lives. In the area of contracts, it is very important to be especially cautious while Mercury is retrograde. Be sure to review all documents carefully and make sure you fully understand what you are committing to. Major purchases are also often best left for after the retrograde period because this is the time for all of us to pull our energies inward and reflect on where we have been and where we are going. Appointments may need rescheduling as the everyday world sputters along. Think in terms of spiritual growth rather than getting mundane matters done. Another common manifestation of Mercury retrograde is the reemergence of the unfinished business of the past. Sometimes people we haven’t heard from in years will contact us or if we have been procrastinating and not completing important matters, we might experience a real urgency to get these things accomplished. We might begin to experience the effects of retrograde Mercury several days before it actually “turns”. Some sage advice: If anything needs to be repaired and you have been putting it off, Mercury retrograde could force repairs. Cars, computers and other everyday household items are at risk and frustrations can mount. The best advice during this relatively short period of time is to relax, take things more slowly and create the space in your life for deep reflection. As the next 3 weeks unfold, remember to take a deep breath when frustrations mount and remind yourself that this too shall pass. As Mercury directs, it takes another 2 weeks or so for the planet to move into new zodiacal territory. So, by January 1, 2012, Mercury will be at 20 degrees of Sagittarius which is where it was when it went retrograde on November 24, 2011. This actually completes the old cycle and begins a new one. In my daily scheduling calendar, I mark the Mercury retrograde periods and when the planet reaches new ground in order to remind myself to go with the flow. This little exercise has always served me well. People born with Mercury retrograde will experience these times as more comforting and natural. This month’s full moon is in the sign of Taurus, a fixed earth sign. There is always great potential for awareness and some clarity during a full moon and whatever began at the new moon on October 26th can now be developed or processed with more persistence and determination for fixed signs offer those qualities to all of us. The real beauty of the lunar cycle is that it is so repetitive. Each month, each new moon, offers a new opportunity to grow just as each new day offers a new beginning. In astrology, we can find many new beginnings as we study the cyclic nature of our planets as they revolve around our sun and symbolically around our natal charts. This full moon stands by itself in some ways as there are no close aspects to it. We truly can attempt to gain clarity about emotional issues and look at the tendencies we have to get stuck and hold onto old feelings and patterns of behavior. When the moon is full it is reflecting as much of the solar light as it possibly can so look deeply into your depths and explore how you manifest your energy to create your physical world. We are still dealing with the intense sign of Scorpio but the moon in the opposite sign of Taurus helps us to ground that intensity with something tangible. Mars in the final degree of Leo has moved into a direct opposition with Neptune and is now beginning to move past that opposition. As it does, it will move into the mutable earth sign of Virgo and begin to form a grand trine to Jupiter in Taurus and Pluto in Capricorn. Any confusion that has been felt regarding taking action on your life may now begin to clear up. It is a very positive time for creating something real from the clarity that can come with this energy. Grand trines can also make us more laid back and because this is an earth grand trine, more physically lazy. For a while this energy will allow healing to take place if we tap into the spiritual reality of who we are. Mars implies the need to act on things and grand trines are not very motivating but any action at all will yield results now. Those with planets in earth signs (Taurus, Virgo, Capricorn), especially planets in the early degrees of earth signs, will find this energy most beneficial. Mars trine Jupiter encourages taking action that expands the current situation while trining Pluto at the same time demands deep and intense acceptance of what is. There can finally be a rising above it all in order to come to terms with whatever was creating confusion and disillusionment (Neptune). Do something concrete with this energy and share it with others while this grand trine is active. As Mercury turns retrograde on November 24th, things will shift once again and this lunar cycle will complete on the 25th just in time for Mercury to do its thing. I will discuss that in depth in my next blog at the next new moon. 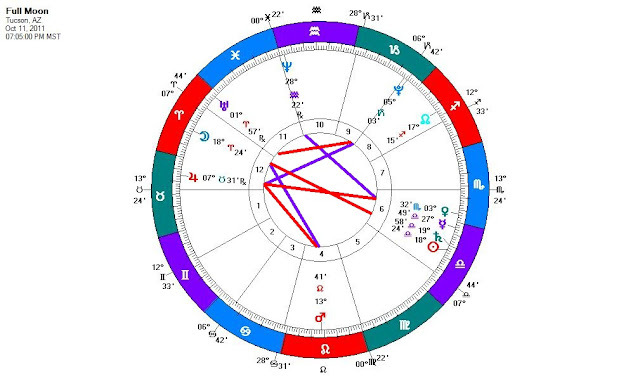 Mercury and Venus have been hanging onto a conjunction since the new moon of October 26th and are now in the mutable fire sign of Sagittarius. As Mercury slows down, preparing for its retrograde period, Venus moves past the conjunction. Generally a conjunction of these two planets is short lived, a day or two so this longer period can be seen as a time that began with intensity in Scorpio and opened up through a generous spirit of communicating love and caring these past two weeks. Saturn, the task master, is moving toward a trine to Neptune. This will become more exact as this year ends and a new year begins. A trine of these planets offers us all the opportunity to marry our spiritual tendencies with our physical reality. Helping those in need and contributing our resources, whether physical or spiritual is a great way to allow this energy expression. More on this as well when it becomes more exact. Finally, I would like to share a paragraph of information I came across while re-reading one my favorite astrology books. It is some food for thought as we open up to what the world is going through during this time as Pluto moves through Capricorn. 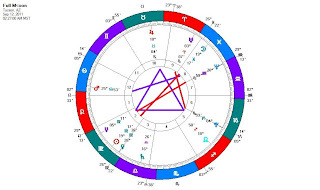 Capricorn refers to the establishment of large scale social schemes and political institutions, but also to their crystallization, which Pluto confronts and often radically upsets. 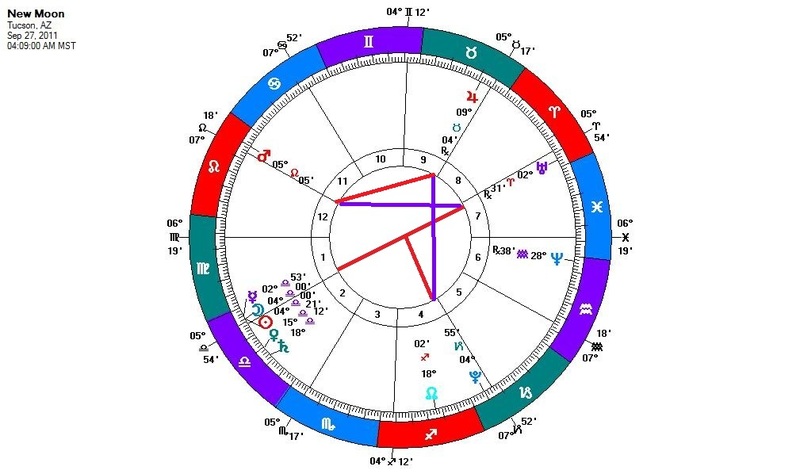 The United States of America began its career under such a Pluto transit, which challenged the rights of the English king, particularly in matters of financial policy. 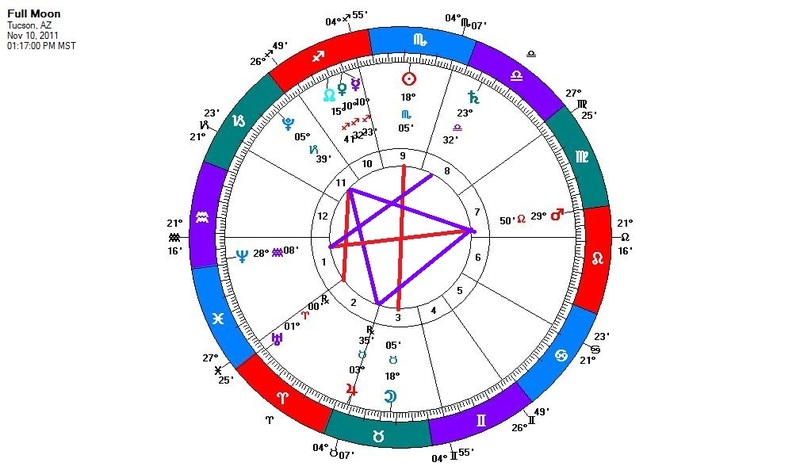 Pluto is in the second house of the US chart with mid Sagittarius rising, a highly significant position as the new nation found in the land of its birth tremendous resources which it ruthlessly and relentlessly tapped and indeed misused because of corporate greed and personal ambition. In France the monarchy was crumbling because of a variety of scandals. Pluto often tends to bring into the open the shadow of political power or personal ambition. It forces any entrenched group to surrender its privilege or else to face revolution or moral-spiritual bankruptcy. It seems probable that Pluto had recently entered Capricorn when Luther challenged the powerfully entrenched Catholic Church. Pages 95-96. First Edition published 1975 under the title The Sun is Also a Star. In light of the revolutions and financial challenges around the globe in the past few years, since Pluto once again entered Capricorn, I thought this quote was extremely interesting. We can take a closer look at the chart of the USA in future blogs. The new moon of October 26th, 2011 is in the fixed water sign of Scorpio. Scorpio is a sign of intensity with a strong element of desire for union. It is often a sign focused on sexuality but not in the physical sense. Scorpios long for union with a soul mate. The sign is deep, dark, mysterious and seldom superficial though one may appear so to cover up the pain of deep feelings of hurt. The sign of Scorpio is also the sign of death, rebirth and the mysteries of existence. Astrology associates the planet Pluto with Scorpio. There are several planetary aspects on this new moon chart, each one distinguishing itself to create complex energies which will no doubt manifest on multiple levels of reality. From the mundane to the deeper psychological and spiritual levels, this new moon is one of intense extremes. With a close opposition (180 degrees) to Jupiter in Taurus, emotions will run high. Some may wonder if the moon is full as Jupiter oppositions may create extreme highs and lows. The key to this is keeping one’s balance. It may feel like an emotional seesaw and weighing everything will be important. Jupiter is in an earth sign so finding balance through the practical application of what you are feeling will help. This is another one of those times to let things develop and not take action despite a strong desire to be expansive in self expression. Jupiter can bring excess as well as good fortune and with a new moon opposition, excess is much more likely. The rhythm of the lunation cycle allows for things to be seeded at new moon with optimal awareness coming at the full moon. Develop ideas and explore deeper feelings while recognizing that this is a new cycle with some energy waxing and some waning (developing and receding). Jupiter is making a close trine to Pluto which is, as we have discussed, still in a long term square to Uranus. The trine is a major outlet but requires a very practical approach, grounded in the reality of what is and not what one wishes or imagines there to be. Jupiter offers some relief from the intensity of the square’s challenges, allowing us to see possible future outcomes developing from all the unexpected and erratic energies that have manifested in the last year or more. Keep in mind that the longer process of the square from Uranus to Pluto is the background energy that must be played out for now. It is, as mentioned previously, transformational on a global level so there is not much an individual can do to change things. It will take a collective effort and those efforts are all around us. Choose wisely if you plan to get involved. The US political system and all of the challenges facing the American people is a good example of the Uranus/Pluto square. The Arab Spring is another example on a more global level. The world is changing before our eyes as we live through these historic times. This is a theme that will repeat for a long period as the square continues. There is a developing T cross forming in the fixed signs, adding more everyday tension and challenge to the current reality on the planet as global ideas develop into action. Mercury and Venus are making a conjunction in Scorpio and they square Mars in Leo in a tight aspect while Mars in Leo moves toward an opposition to Neptune. The fixed signs are highlighted here so anyone with planets in Taurus, Leo, Scorpio and Aquarius are more impacted by this month’s lunation. The stellium in Scorpio insists that we all take a look more deeply into the dark pool of our psyches and become aware of our deep rooted fears about the transformations taking place all around us and within us. Once we allow ourselves to see the personal implications of these fears, we can use the energy of the developing opposition of Mars to Neptune to turn our fears into hope and renewal. Neptune dissolves ego boundaries through spiritual awareness. We have to take this process step by step and these aspects can be helpful in the timing of this process. There may be some personal confusion as the approaching Venus square to Neptune gives way to Mercury’s square. Thoughts will cloud issues for a brief period. Try not to be too decisive without allowing the guidance needed to gain clarity. Neptune is generally an energy that takes time to clarify as the boundaries dissolve. We are invited to use that ego confusion as a sign to turn within and find spiritual strength and wisdom. Remember the New Moon is the beginning of a cycle of development. With the full Moon in Aries opposing the Sun/Saturn conjunction in Libra, keeping our impulses in check is going to be the challenge of this period. Aries is the first of the fire signs and there is an impulsive quality indicating a strong desire to take action. Since the Moon is full, emotions run high and acting on feelings of frustration might seem like the thing to do but beware of all possible consequences. With Saturn in the mix, we are cautioned about accepting the limitations we are now aware of. By balancing our own desires with the needs of others, we have the opportunity to learn what the best course of action may be. With the full Moon trining Mars in Leo, the opportunity is there for making a good impression. The oppositions of this full Moon insist on balance as a way to overcome the potential for appearing oblivious to other people’s needs. Feelings are a great outlet as long as they are not overwhelming in their expression. Mercury, also a part of this opposition with the Moon suggests thinking through what you are feeling and opening up to a more enlightened response since Mercury is making a very close trine to Neptune. Thus we have two encouraging trines from the Moon to help us manage the intensity of the oppositions. One way of working through the energies we continually deal with is to keep a journal of some kind. Looking back 2 weeks we could now see what we were processing with the new Moon since this full Moon is the time of becoming more aware of that process. Growing psychologically and spiritually means working on becoming more aware of how we react or respond to the challenges facing us. These energies come and go quickly unlike the movement of the slower moving outer planets in our solar system. The square from Uranus to Pluto creates tension and deep transformation. Uranus is sometimes revolutionary and Pluto brings about death and rebirth. In the early/mid 1960’s these two planets made a conjunction in the sign of Virgo. Anyone who lived through the 60’s understands the tremendous social changes we experienced at that time. A conjunction of two planets is the beginning of the cycle much like the conjunction of the Sun and Moon each month (new Moon) begins the shorter lunar cycle. We are now experiencing the waxing square from that conjunction and this square will continue well into 2015. It has taken this long for these two outer planets to go from conjunction to square. On a personal level this square is impacting each of us and the degree of challenge depends upon where one’s individual planets are by sign and house. As mentioned previously, the cardinal signs are experiencing this more intensely, particularly those with planets in the early degrees of Aries, Cancer, Libra and Capricorn. On a global level this energy is helping to create the climate of extreme change people are going through all over the planet. The USA is not immune to this and many of the social issues that became prominent during the 60’s are being revisited now. Women’s issues, civil rights, voting rights, protests and long term wars are just a few of the issues that have bubbled to the surface. This is not energy that can be contained. It will find outlets as people, who are now more connected than ever, help to bring great changes to the planet. A waxing square indicates growing pains that create deep tensions that need to be expressed. These changes are often escalated by forces of nature since both Uranus and Pluto symbolize energies that are often unconscious and beyond the control of our ego awareness. Jupiter, now retrograde in Taurus, is making a trine to Pluto. For now there are outlets of expression and opportunities to see possible future outcomes but all of this energy is erratic due to the influence of Uranus. We all must open up to the changes needed for the evolution of our planet. Everything seems a bit bizarre and out of control yet rest assured there is a reason for these dramatic forces we see around us. Get down to the basics of what it means to be human and recognize that each one of us has room to grow beyond the limited awareness we each have. Uranus, first planet outside of Saturn’s orbit represents unexpected change. We are called upon to move beyond the boundaries of the physical plane and attempt to see things beyond our 5 senses. Pluto demands that we let go of what is no longer sustaining us so that something more viable can be born. This is an exciting time if not a bit scary for some. There is potential for chaotic destruction but all of this will serve the purpose of bringing about a new order in the world. Nothing will ever be as it was since Pluto is the energy of death of the old and from that the new will rise from the ashes. In mythology Pluto is the god of the underworld so the transformation will no doubt, force us all to face the dark side of our nature. As Carl Jung believed, we have to shine the light on the darkness and it begins with our own psyches. The unrest we see all around us is also within us. Simply put, if you are not able to work actively with the energies we are experiencing, then let go and let God! When we recognize our limits we learn to let go of trying to control things and we allow ourselves to be guided by what is known as a higher power. The seasons change and shortly after the Autumnal equinox we have a New Moon in Libra, sign of balance, a cardinal air sign. Balance, however, will be elusive as the combination of planets, 5 of them in Libra, opposes Uranus and are squared by Pluto. Remember that square, the one that will be with us until well into 2015! There are five planets in Libra. We have a name for that configuration; a Stellium. Although not as rare as some would like to believe, a Stellium is formed by 3 or more planets usually in the same sign of the zodiac. Of more significance is when there are 4 or more planets involved and this New Moon finds 5 planets in Libra. This concentration of energy in one sign creates a strong focus on Libra, the New Moon and the conjunctions formed within this configuration. All of the various energies are working together which increases the challenge since it is part of a T Cross as well. There is a great deal of tension here since this is a very tight T Cross with a focal point from Pluto. If you have planets in the earlier degrees of the cardinal signs (Aries, Cancer, Libra, Capricorn) this month is going to offer many challenges for growth and change. Try to let go and allow the energy to open your mind to new ways of seeing your reality. Step back from the turmoil you may be feeling or the turmoil you see around you and attempt to see the larger whole that is operating right now. Jupiter is still making a trine to Pluto so it is possible to explore what might develop in the future. Jupiter is expansive and often operates in a way that sets the stage for future opportunity. With a trine to Pluto that opportunity could be intensely transformational. Meanwhile Mars has moved into the fixed fire sign of Leo and is now making a trine to Uranus. Maybe some calculated, well thought out risk taking is in order but be aware that with Venus conjunct Saturn, some of those relationship limitations you might be feeling are actually potentially grounding. New Moons are new beginnings but the full moon always brings the possibility for more awareness so waiting 2 weeks will clarify issues more. Be careful not to react to situations now and to think them through. Mercury, representing thinking and communicating is conjunct the new moon and demands that we think first and then act. The square from Pluto will make this an intense time and the opposition from Uranus will create restlessness and possibly the unexpected. Be as aware as possible and pay attention to the world around you. Acting on emotions will be very problematic. Outlets to this energy are important and they do exist. Look to trines for those avenues to express the pent up frustrations and lack of clarity you are experiencing. Some may believe they know what is best for others. Only you know what is best for you but putting off major decisions if conflict persists is better than reacting to circumstances. Learn to respond after careful consideration. If ever meditation were called for, this is the time for it. Isolation from the problems of the world is also not advised. We are all living through some difficult times even if your own personal reality seems solid. The ground is moving now, if not literally, figuratively. Everyone is impacted by the external conditions so reach out and assist others if you can. With the Mars trine Uranus aspect, try to be open to new ways of expressing yourself. Give yourself permission to explore creatively, even if you have never done anything like it before. Now is a good time for that as it is an outlet for some of the tension most are experiencing. Dance, sing, paint, write and find a way to enjoy who you are becoming. Mars squaring Jupiter warns us to not take on more than we are able to handle. So use good judgment but certainly open up to what is possible now. All of this is the energy of the solar system and it is available to the planet now. We can not control anyone but ourselves so spend the time you need to know yourself a little better and do something positive to contribute to another’s life. Libra is the sign of relating/relationship/balancing self with others. Plant the seeds for growth as this new moon begins and be open to learning something new about yourself and the world at large. In a couple of weeks, the new moon will become full and the opportunity to experience more awareness of these circumstances will present itself. We ebb and flow as do all living things and the lunation cycle is a cosmic reminder of that fact. The Harvest Moon is the full moon closest to the autumnal equinox which takes place on September 23rd. By definition, the full moon is the opposition of the Moon and the Sun, a 180 degree angle which implies tension with the goal of awareness. The moon is reflecting as much of the Sun’s light as possible. From the dark of the moon, new moon to the full moon, the energy waxes, building to this point in time. The tides are highest and so are human emotions. Try to be aware of feelings and what triggers those feelings. The full moon of September 12th takes place in Pisces, a water sign. Thus, feelings are even more pronounced. If there is ever a time to examine oneself on a deep and spiritual level this would be it. The Virgo Sun is reflected so analysis and attention to detail will be challenged by lack of boundaries in order to ultimately recognize the oneness of all. We can see both sides of this dichotomy now. There is also a waning opposition from Mercury (Virgo’s ruling planet) and Neptune, (Pisces’ ruling planet) although it is out of element. * This reinforces the meaning of this full moon. Let’s discuss the meaning of an opposition as it is one of those aspects that imply projection onto others in order to see oneself. We need to own the energy we are feeling and recognize that what appears to be coming from others is also coming from within us. Oppositions are also opportunities for balance as we become conscious of our dualities. Earth opposes water, and air opposes fire. We need both sides of this opposition to be complete. Also note that there are 3 signs in each element thus cardinal fire, Aries opposes cardinal air, Libra; Cardinal water, Cancer opposes cardinal earth Capricorn; Fixed earth Taurus opposes fixed water Scorpio; Mutable air Gemini opposes mutable fire Sagittarius; fixed fire Leo opposes fixed air Aquarius; mutable earth Virgo opposes mutable water Pisces. The most compelling relationships we can have are with those who are our opposites. That is why when I see a Cancer/Capricorn combination I know there is great challenge but also great hope for partners to gain in awareness and grow. Likewise, if you are born during the full moon phase of the lunar cycle, you will often feel like you are on a see saw, trying to balance the two opposites within you. Keep in mind that the Sun sign represents what you are growing toward, its light pulling you to become more vibrant and alive with your fullest potential while the moon pulls on you to remember the past and integrate that into your life for more balance and awareness. The Sun is the expressive, the moon the deep rooted feelings coming from the past. The moon is habitual and so it often implies a comfort not often felt by following through to the fullness of the present. Full moon people are asked to seek the balance of integration and ultimately individuation. The Mercury opposition to Neptune is completing now. Mercury is now past the point at which it retrograded in August. It is time to move forward on plans and projects that may have gotten delayed or shelved. Reexamine the potential as the full moon brings awareness and the waning opposition from Mercury/Neptune helps to bring clarity from the confusion or illusions of the latest retrograde period. With Mercury still in Virgo until September 25th be sure to analyze your options and pay attention to details that may have been overlooked. Along with the full moon and other lunar aspects, this month finds us all still dealing with that pesky square from Uranus to Pluto. Those unnerving and disruptive energies continue to impact the planet and our personal lives, depending on where that energy manifests for each of us. I don’t know that we ever get used to this kind of energy but it is going to be with us for quite a while. We will feel its effects well into the year 2015 when Uranus will finally move past the square to Pluto. It’s a long one as the outer planets move so slowly. For more information on how to obtain a personal chart go to www.starrystarrysky.com. *An out of element aspect occurs when one planet is at the end of one sign making an angular relationship to a planet at the beginning of another sign. Example: Virgo opposes Pisces but a planet at the beginning of Virgo can oppose a planet at the end of Aquarius because it is within the so called orb of influence. Thus, Mercury at 5 Virgo is still considered in opposition to Neptune at 29 Aquarius. August 28, 2011 at 5:04 PM EDT, 6:04 PM CDT, 7:04 PM MDT. 8:04 PM PDT. 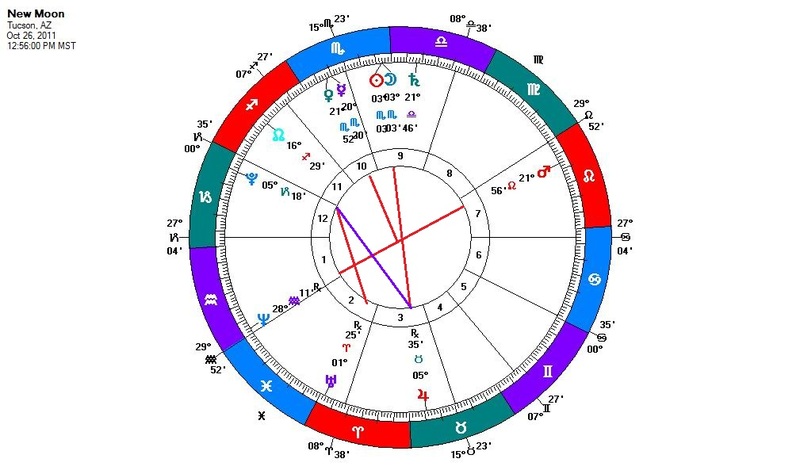 Any time the new moon is also conjunct another planet (in the same degree of the zodiac/ within 6 degrees), the lunation takes on the qualities of the planet in conjunction as well. This doesn't happen each month; however this next lunation cycle begins with a conjunction to the planet Venus in Virgo. Therefore, the Sun, the Moon and Venus form a grand trine (major configuration) to Jupiter in Taurus and Pluto in Capricorn. Meanwhile, Mars in Cancer is squaring Saturn in Libra; Uranus in Aries is continuing a long term square to Pluto in Capricorn and Mercury has just gone direct in Leo. Add an opposition of Neptune to the New Moon for a little less clarity and a real need to let go and let God and this New Moon chart becomes more complex and full of energy that needs sorting out and grounding. Think of this next month in this way and you can make sense of what is happening in the world at large. The earth signs are predominant with this grand trine so there can be clarity and vision for those willing to rise above the conflicts that seem to be everywhere right now. Remember that we are looking at the energy of the planet in general with each lunation cycle as the focus and we can apply this to any other chart, whether it is one's natal chart or the chart of the USA. The personal interpretation is very different from the mundane but the energy remains the same. In general, the square from Uranus to Pluto, a long standing transiting square which tends to define these difficult times, predominates over the faster moving lunation cycle which is in effect for the month. That long acting square was even more challenging while Saturn was in the earlier degrees of Libra forming a T Cross. Anyone with planets in the first decanate (1 degree through 10 degrees) of the cardinal signs (Aries, Cancer, Libra, Capricorn) has been and is still experiencing this energy on a very personal level. Mars is finishing a waning square to Saturn so the energy of deep frustration should begin to lift. With the grand trine in earth signs it is time to focus on what can be done from a practical perspective. Take some of those ideas, separate the illusion (Neptune) from the reality (Earth) and get to work on making things happen in your life. There really isn't much anyone can do about the structural blocks that keep the big games going. With Uranus squaring Pluto, we are all in for some challenging times as power structures (Pluto in Capricorn) get challenged by the unexpected (Uranus in Aries). People and forces are taking action now which will transform society. Let's hope it is for the better though it may not seem so as the chaos persists. Change is never easy. For the cardinal signs Aries, Cancer, Libra and Capricorn, conjunctions from Uranus and Pluto as well as squares and oppositions are usually very challenging and force people to re-evaluate life either through severe external difficulties or deeper internal challenges. With Uranus there is always a need for change which can manifest like sudden and unexpected occurrences that leave us transformed. Pluto often brings a deeper process of death and rebirth while most often it is not literal; it is painful and feels powerful, beyond our control at an ego level. If we look deeper we can see how our path has been leading us to this point in the process. This is not a time to isolate and try to do it all on your own. Reach out and seek help wherever you can find it. The grand trine in earth, influenced by Venus, planet of love and relationship, softens the challenges for a while. Both Uranus and Pluto are slow moving planets which symbolize psycho-spiritual evolution on an individual level and require those who experience this to look deeply within their psyches or fall into a sense of lack of control. The choice is always ours but it often doesn't feel like that. Sometimes we want to blame the world and other people. The energy demands that we each take responsibility for our self. When we come to the next lunation this energy will still be active. There is time to do this so be patient with all that is happening and try to understand at a deeper level, a more spiritual level. Mercury has just gone direct after being retrograde for most of August. It is time to get things moving forward again after what might have been delays. Give it all some time to get in gear since Mercury will not be covering new ground until September 10th. From the mundane to the personal/psychological/spiritual, the background energy of this lunation is the cardinal square of the Uranus/Pluto transit with some respite coming from the grand trine of the new lunation conjunct Venus, trine Jupiter and Pluto. Pluto, being a part of both configurations is the key to unlocking the deeper dimensions of the soul's journey. Allowing the death of the old and whatever rebirth one glimpses will serve a deeper purpose even if one is not fully conscious of what is happening as yet. With Jupiter completing the grand trine, the future can be glimpsed and more uplifting goals can be accessed. It is all hard work but it will pay off in the long run. Monthly lunar cycles are important to explore but always with the understanding that there is much complexity from slower moving planets, particularly at this time in history. The planet is experiencing major transformation which we will explore further in the coming weeks/months. We are also moving into an election cycle which should prove very challenging for those running for office. We will take a look at the major presidential candidates as well as President Obama as the next year unfolds. Questions and comments are always welcome. For more information on the basics of astrology please visit http://www.starrystarrysky.com. It is my hope that this blog will be a place for discussion and learning for all who are interested in the fascinating study of Astrology. I invite you to join me on this journey of discovery as I share my understanding and knowledge and encourage others to do the same. No matter what your level of understanding is, Astrology is a tool that all can benefit from. I welcome your comments, ideas and inquiries. I have over 35 years of experience as an astrologer and counselor. I hold a Master's degree in counseling psychology and have worked extensively with individuals, couples, families and adolescents. My emphasis is on psychological and spiritual growth. Using the birth chart as a tool for understanding life cycles, my approach integrates dream work and Jungian depth psychology. It is my hope that this blog will be interactive and I invite comments and questions. Feel free to e-mail me for more information.